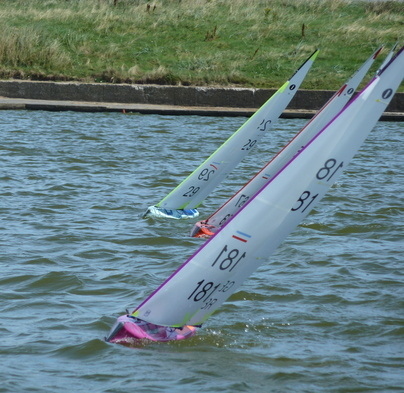 Robot Yachts is a manufacturer of composite hulls, appendages and components for radio controlled racing yachts. Composites specialist James Edwards is based in Sherborne, Dorset, UK, is an experienced sailor, studied yacht design and is conversant with CAD, computer modelling and machining techniques. Robot Yachts builds radio racing yachts to order and is able to offer a wide range of colour finishes. Details of our current production designs, specification and price guides are shown on the following web pages. Our product range continues to expand. Advice on rigs, sails and radio gear is available along with set-up guides. ROBOT NEWS. Over the last few months Tony, who handles enquiries, has relocated from Nottingham closer to Robot Yachts production facility in Sherborne, Dorset but production has not been affected.. This has involved 2 moves, the second over the summer is now nearly complete. During this time there have been inevitable disruptions to communication and Tony's ability to respond has been limited to the essential for which we apologise. If we have missed a response please try again and we will respond as soon as possible. Meantime James, whose workshop facilities are not affected by the moves, is now working full time in the business and has increased production and product development activity as a consequence. NEW CONTACT DETAILS Please check the page header for the latest. The moves have caused 2 changes of contact phone number and a business email address has been adopted. PRODUCTS. Robot Yachts is currently offering a choice of ISAF International One Metre (IOM) and RG65 designs. 2012 IOM European Champion Brad Gibson at Cres, Croatia sailing a Robot Yachts built production BritPOP. 2013 IOM World Champion Robbie Walsh at Sdot, Israel. Robot Yachts production BritPOPs have already proven a game changer in races at every level across the world. The design is exceptional in a full range of conditions and in different hands. The Robot Yachts BritPOP is now in its third year of production and we are working through our building list in date order as fast as we can. See our BritPOP webpage for further details and specification. The Mark 2 version of our original product, the IOM Robot, continues to perform competitively and examples are seen at most of the top UK events. This is an excellent all round design, ideal for the club racer and is in its element on a lazy light weather summer day at the local lake. We are continuing with Robot production and development as time allows. See the Robot webpage for specification. It is no surprise that these great little “car bootable” boats that offer such a serious sailing performance are gaining momentum. We build to order, mostly in pre-preg carbon built to deck level and supplied with our specially developed pre-preg carbon fin and rudder. We have been developing and testing the new Electronica design by Brad Gibson and prodction will start in the new year - watch this space for information. GENERAL. On a limited basis we are able to offer a few almost ready to race boats at various stages of completion, details on request. Note, you will need to order your choice of sails directly from the sailmaker as sailmakers also have extended lead times. For all enquiries, product information, details of our terms of business or to place an order please use the contact details shown on this web home page header.